Internazionali BNL d’Italia will see a rematch of its 2017 final as Simona Halep, and Elina Svitolina powered their way into the final. A Rome finale rematch in consecutive years last happened in 1992-93, when Gabriela Sabatini defeated Monica Seles on both occasions. This will be the seventh meeting between Halep and Svitolina, with their H2H tied at 3-3. While Svitolina has won their last two meetings in 2017 (WTA Finals round robin and Toronto semifinal), the pair are split on their clay-court meetings (French Open semifinal and Rome final in 2017). The world #1 Halep had to dig deep to survive the three-time Rome champion Maria Sharapova from a set down (4-6 6-1 6-4) in two hours and 23 minutes. In the 27-game match, there were 19 breaks of serves from both sides, with Halep claiming 11 of those. 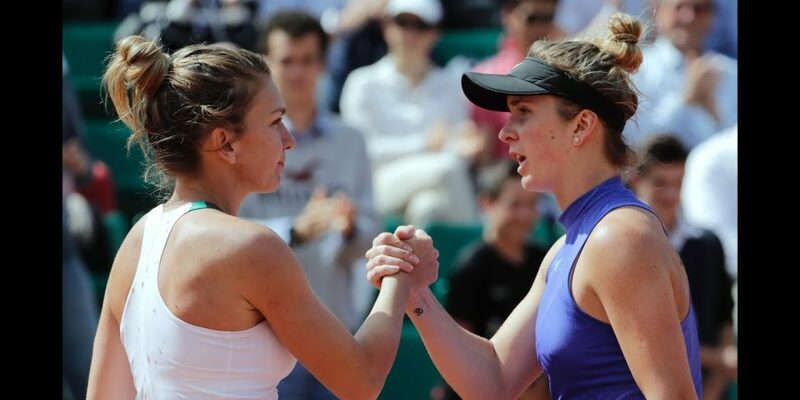 Halep, who secured two easy wins over the Indian Wells champion Naomi Osaka (6-1 6-0) and #7 Caroline Garcia (6-2 6-3) earlier this week, had to play her third-longest match of the season against Sharapova to get into the Rome final for the second time. Halep has the chance to become the first Romanian to claim a title at Rome after the 1978 French Open champion Virginia Ruzici failed to do so, despite getting three opportunities in 1978 and 1980-1981. The two-time French Open runner-up is bidding for her seventh career clay title, with the last one coming at 2017 Madrid. Rome title has been won five times by the top-ranked player in the last 20 seasons (Hingis in 1998, Safina in 2009 and S.Williams in 2013-14 and 2016). Halep’s record as the world #1 currently stands at 26-7, although against top 10 opponents it is 2-3. Her career record in finals is 16-13; however, it drops down to 6-7 when played on clay. Defending champion Elina Svitolina has returned to Rome final with a straight-set win over Anett Kontaveit in 74 minutes. Svitolina was out-hit in the winners tally (18 to 24) but was more effective in converting break points (4/5) than the dangerous Estonian. Apart from dropping a 0-6 set against Russian #1 Kasatkina in the third round, the Ukrainian has been looking in menacing form this week. In the quarterfinals, she defeated former #1 Angelique Kerber, over whom she also prevailed en route to the title last year. Since 1987, when this WTA tournament was moved back to the Italian capital, eight players have won this title multiple times, including big names such as S. Williams, Sharapova, Seles, C. Martinez and Mauresmo. Svitolina, who has won the most titles on the tour since 2017, is seeking her third trophy of the year. She has prevailed in both of her finals earlier this season, at Brisbane (d. qualifier Sasnovich) and Dubai (d. Kasatkina). The Ukrainian, aiming for her third successful title defense campaign (Baku 2013-14 and Dubai 2017-18), has an impressive career record of 11-2 in the finals (3-0 on clay). She has not lost a final since the runner-up finish at 2016 WTA Elite Trophy (l. Kvitova).